When entering the Taiwan market, most B2B companies should start by doing a business market survey. Taiwan has about 1.3 Million companies of all sizes but not many companies would target all of them. For the sake of effective marketing it is important to narrow it down; which companies should you target? Knowledge and experience from other countries will of course be a great guidance, but to really know, a thorough survey is necessary. There are of course many methods that can be used to reach Taiwanese companies. Good databases are necessary to start contacting companies. LinkedIn is an increasingly useful resources. However, it is scarcely used by Taiwanese people who are not directly involved with international businesses. Therefore huge segments of the Taiwan business community are not on LinkedIn. Online job banks like 104, 1111 and Yes123 can be good sources for business information but it takes an effort to collect it. In years past it was possible to just purchase company lists, however, these companies are dwindling due to privacy laws and costs of keeping lists up to date. Some companies provide good quality databases of business information like for example Dun & Bradstreet. Many industry associations have name lists online that you can access. Does your company sell to fresh startups? Every month the Ministry of Economic Affairs publish a list of the companies that were formed the previous month. It will tell you the name of the company, who is their responsible person and how much money they have invested as paid in capital. What they will not provide is any contact information other than their registered physical address. That means you either have to rely on snail mail, or you have to try to find their contact information online. There are companies that have large email databases that will offer to do surveys and market research via email. You also have to ensure that you are not violating the Taiwan Personal Information Act. Every person contacted using private information has the right to ask for proof that they have given your company the right to contact them. If you do not have this proof, you could be fined quite a lot of money by the government. If you find their information in a public place like on a website you are of course also in the clear. Some companies have large numbers of customers and offer to contact them on your behalf. One example would be media companies who have large numbers of subscribers. When a person accepts their subscription they are often also agreeing to be contacted by the company and their partners. So the email would say something like “Dear Member, we are ABC Times, please help answer these questions from XYZ Brand.” Assuming they have proof that the user has opted in, there is no legal issue. But the effectiveness of these emails are dwindling fast. Think about when you replied to an email that was not from a private person you know last? Surveys via email are good for for short simple questions or longer questionnaires where subject is strongly motivated. A common entry point into Taiwan is to hire the trade office from the company’s home country. Many of them employ excellent consultants who knows Taiwan and the markets. There are of course big differences from one office to another in terms of services offered. There are also big differences in how they charge. Since most of them are funded by their government’s, home rules apply. Some of them are not allowed to charge at all while some have to charge at least as much as consultants in their own countries. There are also several excellent private consulting companies that routinely act as coordinators to help companies enter the Taiwan market. All these organizations have limited staff resources so when they need to contact larger number of companies, many of these consultants and trade offices outsource the calling to Enspyre. The most efficient way to reach the right company and the right person is the phone. 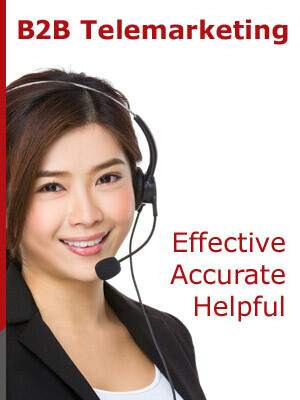 Enspyre is the leading B2B Telemarketing firm in Taiwan. Starting in 2002, Enspyre has performed thousands of business survey projects. With a staff of close to 50 telemarketing professionals, Enspyre can take on both small and large surveys. We can work directly with the company itself or cooperate with a partner like a market consultant. Salesforce.com is a very large SaaS company that services millions of companies around the world. However, in Taiwan they do not have a branch office. Early in their Taiwan market entry, Salesforce.com hired Enspyre to do surveys of businesses to determine which segments to concentrate on. We finished in depth surveys with over 700 Taiwanese companies, giving Salesforce.com and their local partner a strong direction to develop their market strategy. Tech and IT companies are especially suitable to use the phone to survey companies since their products are often not very easy to grasp in a short time. Let’s say you are asking IT Managers what kind of email security products they are currently using and if they are aware and interested in some new emerging technology, the telemarketing agent can not only help encourage the completion of the survey but also help clarify answers for clearer coding. A rule of thumb is to not ask more than 10 questions. More than that and the most friendly person is likely to hang up the phone. Over the years, fewer and fewer companies ask Enspyre to do pure information surveys. Every business first and foremost wants to reach new customers, and the great thing with a professional phone survey is that these two goals can be combined. By using friendly questions in the beginning to uncover perhaps what similar products they are using and what challenges they are facing, it is possible to segue into telling them about the selling points of your own products. If the selling points are compelling enough, it is often possible to make them interested in getting a phone call or visit from a sales person. Based on the information obtained during the first call, further follow-up calls can be scheduled. Perhaps the data shows there are several companies who plan to purchase something new the following year? Call them back! Coding refers to creating clean databases. Should phone numbers be written “+886-X-XXXX-XXXX” or “886XXXXXXXXX”? Should people name be recorded in two columns or one? Should using a “Customer Relationship Management” system be recorded as such or as “CRM” or perhaps as “Salesforce.com”? By maintaining clean data you make it easier to search and run statistics on the results. Once the survey is finished it is important to have skilled project managers who can do quality control to ensure all data was properly recorded. If you are starting up a new operation in Taiwan and want a good one-stop overview of business rules in Taiwan, the book How to Start a Business in Taiwan is a great start beginning. This book is written by Enspyre Co-founder and CEO Elias Ek and it covers all the legal areas for how to set up your company, apply for visas for foreign employees and labor laws.